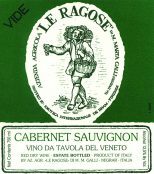 Terroir: Le Ragose Cabernet Sauvignon is produced from estate vineyards sitting above 1200 feet in elevation. The vineyards are ideally situated with a south-west exposure and soils of clay and magnesium, calcium and iron based gravel. The vineyard was planted to Cabernet in 1987 as it was to high in elevation to successfully ripen Corvina. Vinification: The grapes are macerated for up to 12 days and fermented at cool temperatures in stainless steel tanks, followed by 24 months aging in new and used Troncais and Allier oak casks. The 2015 Cabernet is a deep, dense ruby red with violet reflections. Lush and powerful bouquet full of cassis, olive, dark chocolate and pepper. Distinctive, ample and full with a long and persistent finish. Excellent with pasta dishes, roasted red and white meats (especially lamb and duck) Gorgonzola cheese and radicchio dishes.